This past week marked the 80th birthday of the Bayonne Bridge, prompting me to muse about my lifelong love affair with bridges—some in particular. I love bridges. I’m not entirely sure why. Partly it’s the look of them: They seem almost alive, taking off in a leap of concrete, stone, or steel, somehow infinitely optimistic and everlastingly hopeful. Partly it’s their function: Bringing things together, connecting people and places that were previously divided. And of course, bridges often cross moving water—another of my favorite things. But though I love them all, some bridges in particular hold a special place in my heart. Many years ago I worked north of New York City (in Connecticut and later in White Plains). 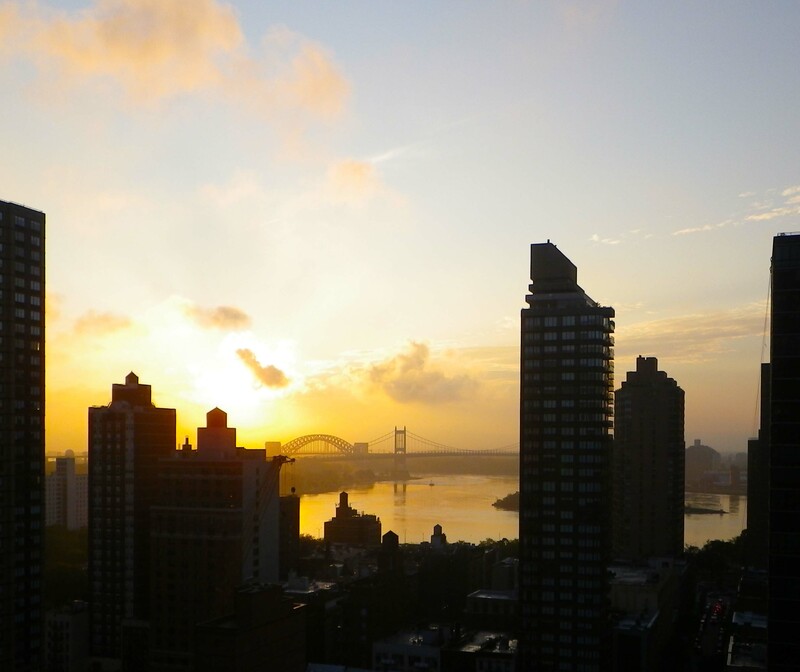 The hours were grueling—some days I’d leave my apartment at 5 AM and not return until 11 PM. Sometimes I drove, but I preferred to take the Metro-North train. I relished the peacefulness of the scenery rolling by. As we crossed the Harlem River, I’d catch sight of one bridge in particular, a study in contrasts: graceful, soaring, yet solid, composed of two steel arches with slightly different curvatures, so they were closer together at the top of the arch and wider apart at the bases, anchored in solid stone towers. The rising sun would touch this bridge and (so I thought) paint it a lovely shade of rosy pink. The memory of that beauty was often the nicest part of my day. But for years, I didn’t know what the bridge was called, or even where, exactly, it was. All I knew was that the sight of it reliably brightened my mornings. One day I happened to mention the bridge to my father, a retired naval officer who had once been stationed in New York City, but now lived hundreds of miles away. He recognized it immediately from my description: “That’s Hell Gate Bridge,” he said. An odd name for a structure of such harmonious beauty! I hadn’t heard of Hell Gate before, and my dad explained it was where the Harlem River joined the East River. Hell Gate was a treacherous body of water characterized by converging currents and occasional whirlpools that had been the doom of hundreds of ships over the past several centuries. “As a young ensign, I was on a ship that went through Hell Gate,” my father said. “But I don’t recall that the bridge was pink.” That would have been in the late 1940s; I can’t recall for certain what kind of ship he told me it was, but my memory insists it was a destroyer. After my father told me its name, I studied it often from the train windows. And one day, when I’d left for work later than usual, I discovered it wasn’t the rising sun that made the bridge pink—it really was pink. It’s an unconventional choice for a hardworking industrial structure, and strictly speaking, it wasn’t pink at first. 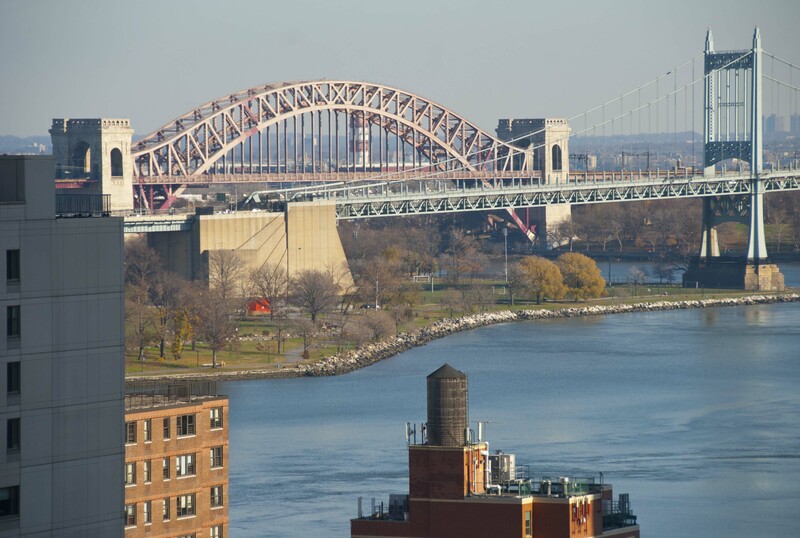 Wikipedia calls it “Hell Gate Red”, and my father was correct—Hell Gate Bridge was painted that color only in 1996. But the tint has since faded to a soft dusky rose, almost a pastel. 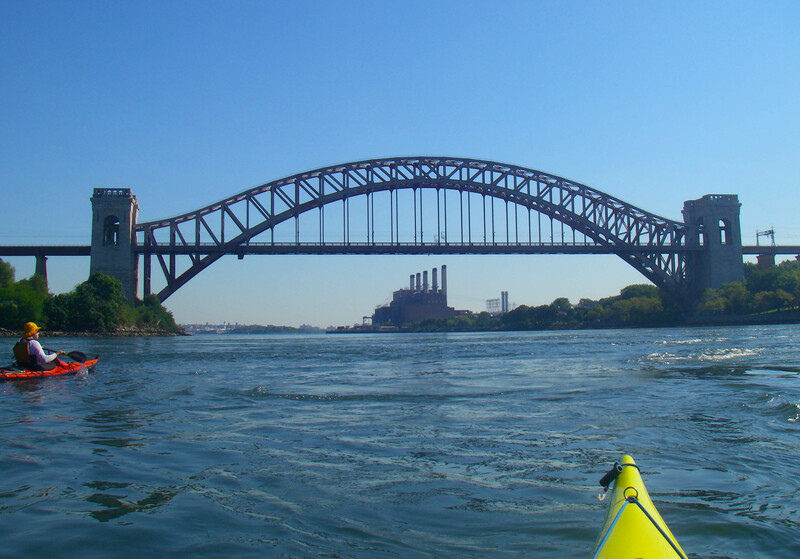 One of the great joys in my later life was kayaking under the Hell Gate Bridge for the first time—but that’s another story. 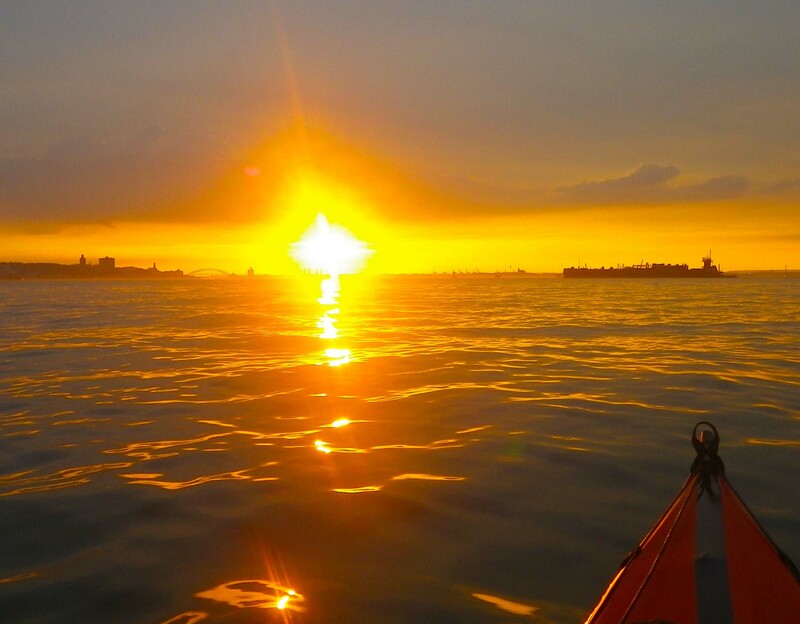 A few years back, I was kayaking in a different direction entirely, far to the south of Manhattan, by the northern tip of Staten Island. As we paddled through the Kill Van Kull (which separates Staten Island from Bayonne, New Jersey), a stunning sight appeared: a bridge that, much to my surprise, was almost the twin of my beloved Hell Gate. It was the sleek and lovely Bayonne Bridge. The two bridges are so close in design they could almost be sisters—and in fact, they pretty much are. Their beauty is no accident. According to Wikipedia, “Lindenthal’s work was greatly affected by his pursuit for perfection and his love of art. His structures not only serve the purpose they were designed for, but are aesthetically pleasing to the public eye.” Indeed! There’s a third sister (or perhaps cousin): The world-famous Sydney Harbour Bridge. Although designed by a different firm, the Sydney Harbour Bridge was inspired by Hell Gate and Bayonne. I also learned that the Hell Gate Bridge was so perfectly engineered that when the main span was lifted into place, the adjustment required was a mere half-inch! 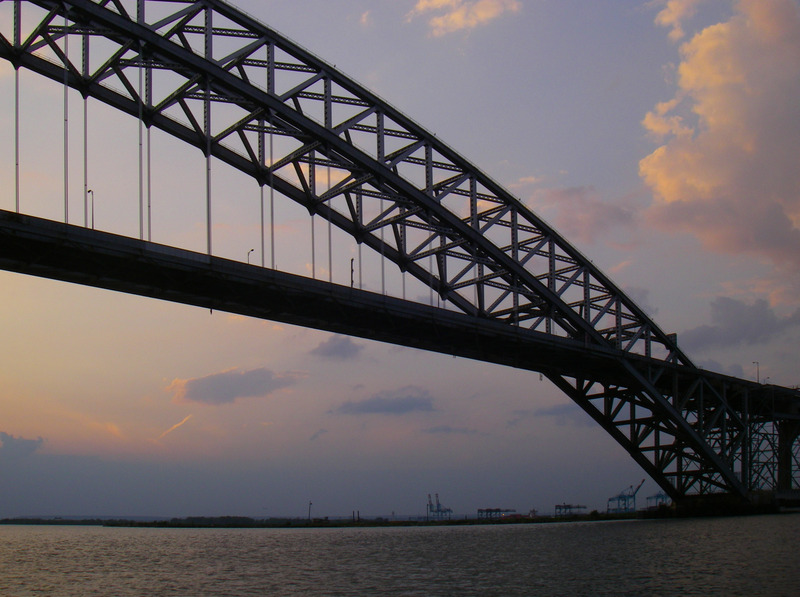 The Bayonne Bridge is now firmly ensconced in my pantheon of beloved bridges. Any time I paddle south these days, I try to make time to admire her. There’s a point in the harbor just south of Governors Island that I like to call “Five Bridges”, because when the visibility is good, you can see five bridges: the Brooklyn, Manhattan, and Williamsburg Bridges receding up the East River; the Verrazano-Narrows Bridge to the south, and the Bayonne Bridge to the west. 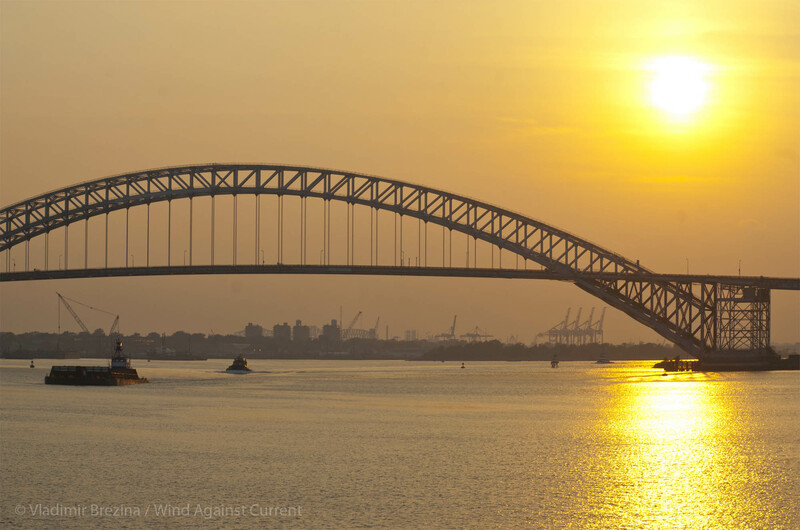 They’re all beautiful, and all iconic—but the fairest of them all is always the Bayonne Bridge. For sentimental reasons, Hell Gate will always remain queen of my heart—but the Bayonne Bridge is a very close second. 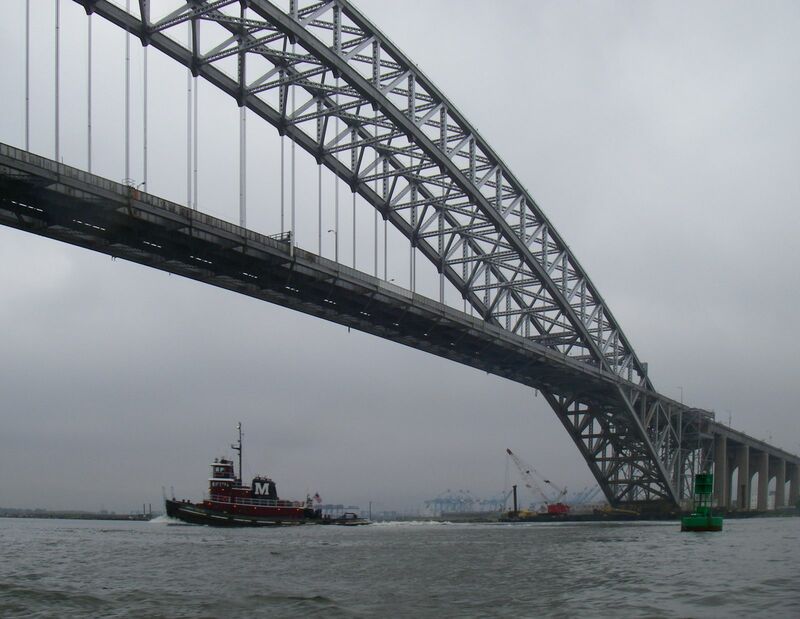 This entry was posted in History, Kayaking, New York City, Science and Technology and tagged Bayonne Bridge, Bridges, Hell Gate Bridge, New York City, New York Harbor. Bookmark the permalink. Interesting piece and nice photos, as well! Do you have any photos that really show the “pinkness” of the bridge? The link to the Sydney Bridge is so cool! And I love the input from your Dad, as well. I also have a fascination with bridges. They’re all so different in design. I used to have a fear, as well. When I was a kid, I always closed my eyes when we drove over bridges because I was afraid they would break, and we would fall. 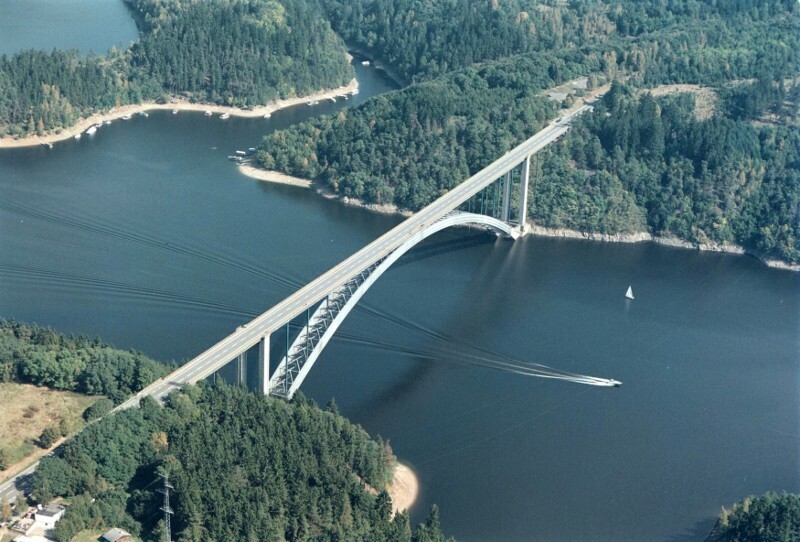 Then my Dad explained how he designed bridges (as a civil engineer)–in fact, some that we drove on! Knowing my Dad designed them removed my fear, and probably enhanced my fascination. For the whole complicated story of the various red, lavender, or pink colors that the Hell Gate Bridge seems to assume in photographs of different vintages, see here. Great reading. I probably have seen the Bayonne bridge but as I do not have the same fascination with these metallic monsters I have probably filtered it out ;) I will look for it next time I am in the neighborhood. :-) But it’s never the end, is it??? You still need to round the Battery (and battle those evil East River ferries). And then then there’s the slog against the current (and sometimes wind) up the Hudson…. beautiful photos and tribute! thank you! We did, thank you! And you too? 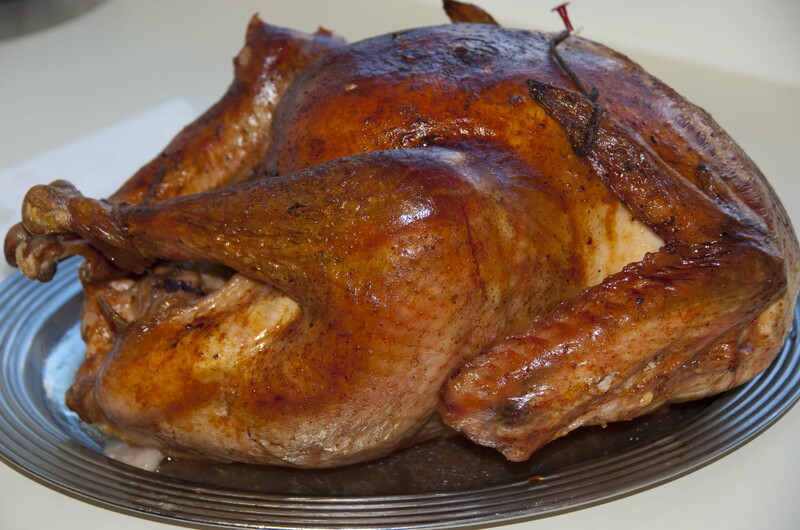 I am so glad you liked the post…. How amazing. So Sydney Harbour Bridge is actually a copy! Not an exact copy, I believe, but closely inspired by it. Oh oui, quelle beauté d’envol dans cette arche ! Vraiment magnifique structure, comme un appel d’infini ! Dans l’extrême beauté de cette photo l’on peut voir tout ce qu’apporte la sensibilité d’un regard.